You Are Here: Tools & Accessories. 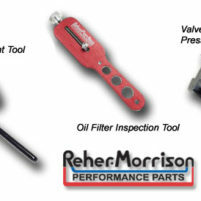 Reher-Morrison’s engine cradles are ideal for storing or shipping your Small Block or Big Block Chevrolet engine blocks or complete carb to pan engines. These are the same cradles (stands) that we use in our shop for storage and also, to ship blocks and complete engines to our customers worldwide. Commercial transports are often very rough on heavy items such as complete engines. This can often result in damage to your valuable investment. Years of shipping engines on various types of commercial carriers (i.e. UPS, FedEx and truck lines), have taught us what is required to insure our customers engines are received in good condition. Our “STANDARD” cradles are made from 1.250″ square steel tubing. 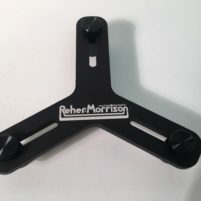 The stress points where the upright supports are connected to the base are reinforced by welded steel gussets to insure they won’t bend or collapse from heavy handling like some cheaper stands made from lighter materials without the extra reinforcement. These cradles are designed to support the engine block at the front by the engine mount bolt holes, and at the rear by the bell housing bolt holes and the bell housing dowel pins. The outboard base supports are wider than most other engine cradles, which increases stability, and they come pre-drilled to accept the “OPTIONAL CASTER KIT”. 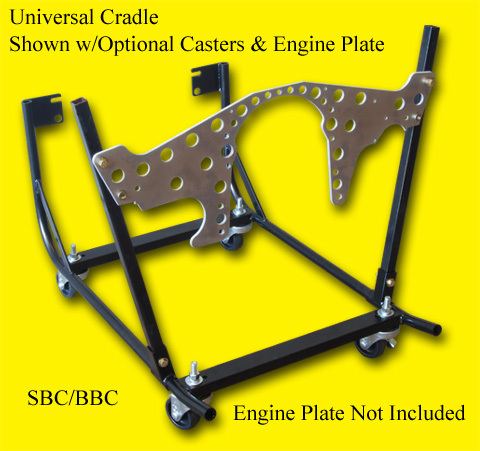 Our “UNIVERSAL” cradles work extremely well for dry sump applications. The flexibility of the two front legs affords plenty of clearance for the dry sump pump and oil lines. 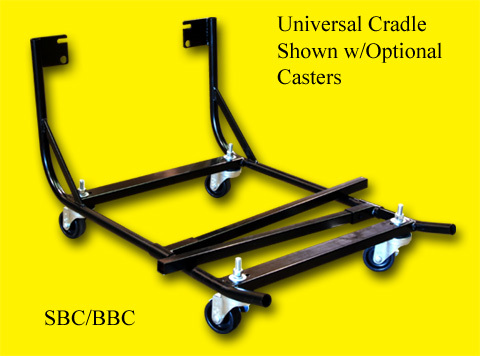 Intended for use with front motor plates, these cradles have recently been improved with several upgrades. 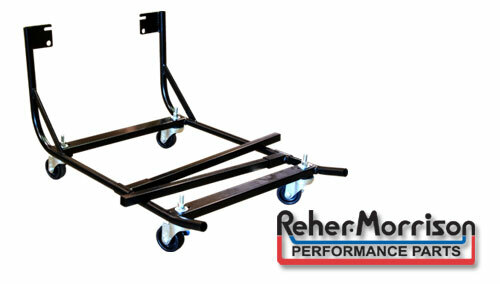 We have welded steel gussets to the rear legs for greater strength and stability. The two cross members at the base have been expanded to 2″ in width and the cradles are pre-drilled to accept the “OPTIONAL CASTER KIT”. The 2 front legs, which are removable, are extra long so you can cut them to the required length to suit your needs. The registers, that they bolt into, pivot both left and right, and also slide back and forth for easy alignment. 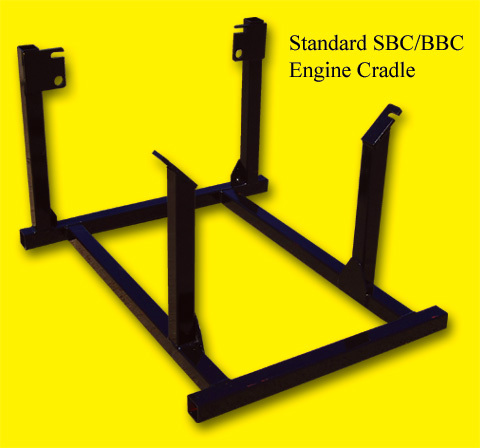 Protect your valuable investment by using one of these dependable, high quality engine cradles.